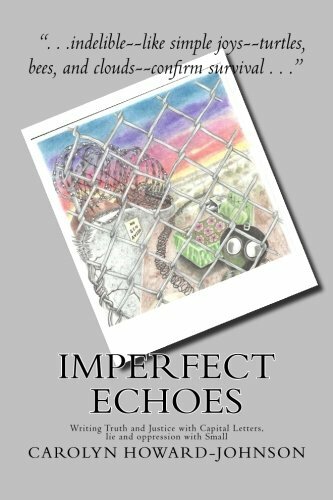 For Poetry Monday this week I’m going to give a shout-out to my writing buddy Carolyn Howard-Johnson, who has a relatively new poetry book out called Imperfect Echoes: Writing Truth and Justice with Capital Letters, lie and oppression with Small. The book includes a few reprints from our Celebration Series collaborations, and is beautifully illustrated with images by Richard Conway Jackson, who is currently in prison in California. All proceeds from the book are being donated to Amnesty International. The book was inspired by Czeslaw Milosz' The Captive Mind and includes a range of poems focused around the utterly relevant topics of Peace, Tolerance, Hope, Truth, Justice, and Acceptance (note the capital letters). Carolyn’s poems, as always, manage the delicate balance between easy accessibility, and deep complexity as they explore big concepts through everyday events. Here’s a sample from the last poem in the book "Interpreting Fairy Tales"
troll waits under a bridge.